Comments Absolutely flawless and perfect gemstone! Finest golden yellow color, totally eye clean, superb size and a perfect cut! And to add to the perfection, absolutely and fully natural and untreated! This Ceylonese Yellow Sapphire is a gem that can be termed as the perfect gemstone not only in looks but also in Jyotish powers! 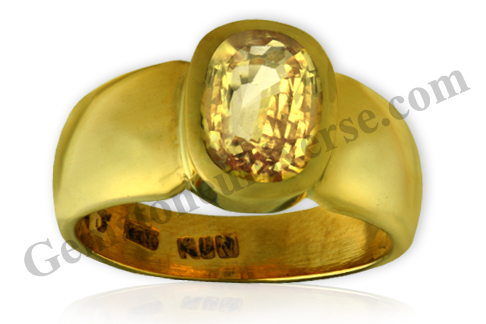 A Sattvik gemstone to capture the powers of the Sattvik planet – Jupiter! Set in a solid 22k gold ring!